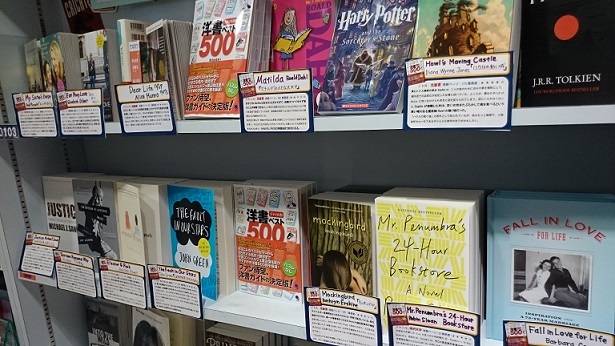 書店で洋書キャンペーンに！　YOUSHO BEST 500 surrounded by books it recommends at the book store. JANRUBETSU YOUSHO BEST 500 (500 best English language books by genre for Japanese readers) is a guidebook of English language books for a wide range of Japanese readers. It includes every genre from children’s books to business books. There has never been this kind of guidebook in Japan, and bookstores have used JANRUBETSU YOUSHO BEST 500 for book sales and campaigns.